South African President Jacob Zuma has paid tribute to Thomas Madigage, following his tragic death. Madigage was assistant coach of the South African football team. THOMAS MADIGAGE, ASSISTANT coach to South Africa’s national football team Bafana Bafana, died in a car crash late Thursday, police confirmed. “Mr Madigage passed away last night between 10pm and 12am (2000 GMT and 2200 GMT),” said police spokesman Hangwani Mulaudzi. The 40-year-old Madigage was declared dead on the scene. Bafana coach Gordon Igesund appointed the former national midfielder as assistant coach in July. “Tommy Madigage is without a doubt the most successful assistant coach in this country in the last 10 years,” Igesund said at the time. He played for Switzerland’s FC Zurich from 1995 to 1996 and several national clubs before his retirement in 2002. South African President Jacob Zuma said his death was a loss to the nation. “On the field we remember his speed and agility as well as the ability to shoot and score from a very long distance,” said Zuma in a statement. After this Madigage worked as assistant coach at local club SuperSport United until July, helping the team win several league titles. News of the popular trainer’s death shocked the country on Friday, with tributes pouring in on radio news and social media. 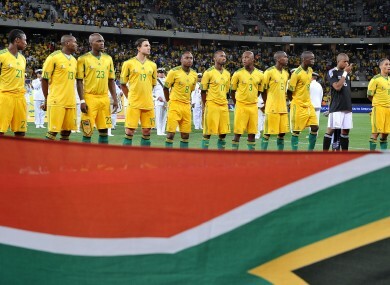 “We are shocked and at a loss for words,” said South African Football Association president Kirsten Nematandani in a statement. Email “South Africa assistant coach killed in crash”. Feedback on “South Africa assistant coach killed in crash”.